Italy meets Louisiana on the streetcar line in downtown New Orleans. About the restaurant & décor: High school buddies Andy Ticer and Michael Hudman had already built a successful restaurant company in Memphis when they headed due South to open Josephine Estelle (named for their daughters) at the trendy Ace Hotel New Orleans. 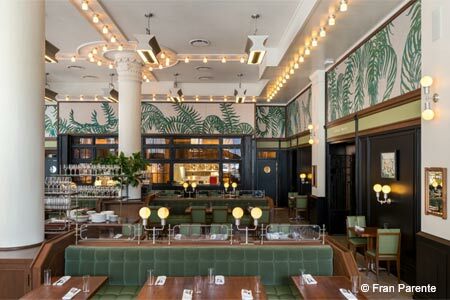 In a century-old downtown building, the eatery occupies an expansive 5,000 square feet with green velvet banquettes, striking murals of palm trees, a wraparound bar, and lighting that emphasizes the clear Art Deco design. Huge columns reach up to the sky-high ceiling. Massive windows allow guests to watch the streetcars rumbling by. Food & Drinks: The Italian food with a Southern twist from chef Ysaac Ramirez is the star of the show, and it is indeed a production. A finely textured gemelli is accented with “Maw Maw’s Gray,” a type of red sauce common in Cajun country. And while pasta is the calling card here, there are other menu standouts, like the softshell crab appetizer with avocado aïoli and especially the sunchokes salad with crème fraîche and dill. A well-organized and diverse wine list complements the Italian theme. Don’t think of leaving before the rich, creamy peanut budino (pudding) graces your table for dessert.